Christopher Carson, trapper, guide, Indian agent, soldier, was born in Kentucky in 1809 and soon emigrated with his family to Missouri. When 17 he joined a hunting expedition and for eight years lived as a trapper, ranging as far as California in 1829. He later was appointed hunter for Bent's Fort. When returning from a visit to his family he met John C. Frémont who hired him as guide for his explorations. Since Carson know many of the Indian tribes, their languages and their territories he proved invaluable to Frémont, actively participating in the conquest of California and in the battles for the recovery of Los Angeles. In 1847 Carson went to Washington, bearing dispatches. In 1853 he drove 6,500 sheep over the mountains into California. Upon his return he was appointed Indian Agent at Taos in New Mexico. As agent he was instrumental in bringing about treaties between the United States and the Indians. With the advent of the Civil War Carson aided in organizing the first New Mexican Volunteer Infantry and took part in the battle of Valverde in 1862. In 1865 he was brevetted brigadier general of volunteers. He died in 1868. Known best as an explorer/mountain man, Kit Carson also was an Indian agent and had a long military service record. He accompanied three of the Fremont expeditions as a guide. Born in Madison County, Kentucky, near the city of Richmond, Carson was raised in Franklin, Missouri, where his family moved before his second birthday. Carson's father, Lindsey Carson, was a farmer of Scots-Irish descent, who had fought in the Revolutionary War under General Wade Hampton. There were a total of fifteen Carson children: five by Lindsey Carson's first wife, and ten by Kit's mother, Rebecca Robinson. Kit was the eleventh child in the family. The Carson family settled on a tract of land owned by the sons of Daniel Boone, who had purchased the land from the Spanish, prior to the Louisiana Purchase. The Boone and Carson families became good friends, working, socializing, and intermarrying. Carson was seven when his father was killed by a falling tree while clearing land. Lindsey Carson's death reduced the Carson family to a desperate poverty, forcing young Kit to drop out of school to work on the family farm, as well as engage in hunting. At age 14, Kit was apprenticed to a saddlemaker in the settlement of Franklin, Missouri. Franklin was situated at the eastern end of the Santa Fe Trail, which had opened two years earlier. Many of the clientele at the saddleshop were trappers and traders, from whom Kit would hear their stirring tales of the Far West. Carson is reported to have found work in the saddle shop suffocating: he once stated "the business did not suite me, and I concluded to leave [The workman's saddle shop]". At sixteen, Carson secretly signed on with a large merchant caravan heading to Santa Fe tending the horses, mules, and oxen. During the winter of 1826-1827 he stayed with Matthew Kinkead, a trapper and explorer, in Taos, New Mexico which was known as the capital of the fur trade in the Southwest. Kinkead had been a friend of Carson's father in Missouri, and Kit began learning the skills of a trapper from him. Additionally he learned languages and became fluent in Spanish, Navajo, Apache, Cheyenne, Arapaho, Paiute, Shoshone, and Ute. After gaining experience with his girlfriend along the Santa Fe Trail and in Mexico on various expeditions, Carson signed on with Ewing Young and forty other fur men in the Spring of 1829, his first official outing as a trapper. The journey took the band into unexplored Apache country along the Gila River. Ewing's group was approached and attacked by Apache Indians. It was during this encounter that Carson shot and killed one of the attacking Indians, the first time he killed another person. Carson attended an annual mountain man rendezvous during the summer of 1835 (at age 24) which was held that year along the Green River in southwestern Wyoming. He became interested in an Arapahoe woman whose name was Singing Grass (Waa-ni-beh), whose tribe was camped nearby. Singing Grass is said to have been popular at the rendezvous, and also caught the attention of a French-Canadian trapper, Joseph Chouinard. When Singing Grass chose Carson over Chouinard, the rejected suitor became belligerent. Chouinard is reported to have disrupted the camp, and finally it seems Carson could tolerate the situation no longer. Words between the two were exchanged, and Carson and Chouinard charged each other on horses with drawn pistols: Carson blew off the thumb of his opponent, while Chouinard's shot missed. This incident is said to have made Carson renowned among the mountain men, but was considered to be uncharacteristic conduct for him. Carson considered his years as a trapper to be "the happiest days of my life". Accompanied by Singing Grass, he worked with the Hudson Bay Company, as well as the renowned frontiersman Jim Bridger, trapping beaver along the Yellowstone, Powder, and Big Horn Rivers, and was found throughout what is now Colorado, Utah, Wyoming, Idaho, and Montana. Carson's first child, a daughter, was born in 1837, named Adeline. The couple's second daughter was born in 1839. Sadly, Carson's wife developed a fever shortly after the child's birth, and died. At this time, the nation was undergoing a severe depression (see Panic of 1837). The fur industry was undermined by changing fashion styles: a new demand for silk hats replaced the demand for beaver fur. Also, the trapping industry had devastated the beaver population; this combination of facts ended the need for trappers. Carson stated, "Beaver was getting scarce, it became necessary to try our hand at something else". He attended the last mountain man rendezvous, held in the summer of 1840 (again at Ft. Bridger near the Green River) and moved on to Bent's Fort, finding employment as a hunter. Carson married a Cheyenne woman, Waa-nibe, in 1841 but Waa-nibe died several months later not long after the birth of their daughter Adeline. By 1842 he met and became engaged to the daughter of a prominent Taos family: Josefa Jaramillo. After receiving instruction from Padre Antonio José Martínez, he was baptized into the Catholic Church in 1842. When he was 34, he married 14-year-old Josefa, his third wife, on February 6, 1843. They raised fifteen children, the descendants of whom remain in the Arkansas Valley of Colorado. Carson decided early in 1842 to return east to bring his daughter Adeline to live with relatives near Carson's former home of Franklin, for the purpose of providing her with an education. That summer he met John C. Frémont on a Missouri River steamboat in Missouri. Frémont was preparing to lead his first expedition and was looking for a guide to take him to South Pass. The two men made acquaintance, and Carson offered his services, as he had spent much time in the area. The five month journey, made with 25 men, was a success, and Fremont's report was published by Congress. His report "touched off a wave of wagon caravans filled with hopeful emigrants" heading West. Frémont's success in the first expedition lead to his second expedition, undertaken in the summer of 1843, which proposed to map and describe the second half of the Oregon Trail, from South Pass to the Columbia River. Due to his proven skill as a guide in the first expedition, Carson's services were again requested. This journey took them along the Great Salt Lake into Oregon, establishing all the land in the Great Basin to be land-locked, which contributed greatly to the understanding of North American geography at the time. Their trip brought them into sight of Mount Rainier, Mount Saint Helens, and Mount Hood. One purpose of this expedition had been to locate the Buenaventura, a major east-west river that was believed to connect the Great Lakes with the Pacific Ocean. Though its existence was accepted as scientific fact at the time, it was not to be found: Frémont's second expedition established that this mystical river was a fable. The second expedition became snowbound in the Sierra Nevadas that winter, and was in danger of mass starvation: however, Carson's expertise pulled them through, in spite of being half-starved-their mules "ate one another's tails and the leather of the pack saddles." The expedition moved south into the Mojave Desert, enduring attacks by Natives, which killed one man. Also, when the expedition had crossed into California, they had officially invaded Mexico. The threat of military intervention by that country sent Fremont's expedition further southeast, into Nevada, at a watering hole known as Las Vegas. The party traveled on to Bent's Fort, and by August, 1844 returned to Washington, over a year after their departure. Another Congressional report on Fremont's expedition was published. By the time of the second report in 1845, Frémont and Carson were becoming nationally famous. Somewhere along this route, Frémont and party came across a Mexican man and a boy who were survivors of an ambush by a band of Natives, who had killed two men, staked two women to the ground and mutilated them, and stolen 30 horses. Carson and fellow mountain man Alex Godey took pity on the two survivors. They tracked the Native band for 2 days, and upon locating them, rushed into their encampment. They killed two Native Americans, scattered the rest, and returned with the horses. On June 1, 1845 John Frémont and 55 men left St. Louis, with Carson as guide, on the third expedition. The stated goal was to "map the source of the Arkansas River", on the east side of the Rocky Mountains. But upon reaching the Arkansas, Frémont suddenly made a hasty trail straight to California, without explanation. Arriving in the Sacramento Valley in early winter 1846, he promptly sought to stir up patriotic enthusiasm among the American settlers there. He promised that if war with Mexico started, his military force would "be there to protect them." Frémont nearly provoked a battle with General Jose Castro near Monterey, which would have likely resulted in the annihilation of Frémont's group, due to the superior numbers of the Mexican troops. Frémont then fled Mexican-controlled California, and went north to Oregon, finding camp at Klamath Lake. No watchman was posted on the night of May 9, 1846, when Carson awoke to the sound of a thump. Jumping up, he saw his friend and fellow trapper Basil Lajeunesse sprawled in blood. He called an alarm and immediately everyone else came to: they were under attack by Native Americans estimated to be several dozen in number. By the time the assailants were beaten off, two other members of Frémonts group were dead. The one dead warrior was judged to be a Klamath Lake Native. Frémont's group fell into "an angry gloom." Carson was beside himself, and Fremont reports he smashed away at the dead warrior's face until it was pulp. Fremont, Memoirs, p. 492. To avenge the deaths of his expedition members, Frémont chose to attack a Klamath Tribe fishing village named Dokdokwas, at the junction of the Williamson River and Klamath Lake, which took place May 10, 1846. The action completely destroyed the village, and involved the massacre of women and children. After the burning of the village, Carson was nearly killed by a Klamath warrior later that day: his gun misfired, and the warrior drew to fire a poison arrow; but Frémont, seeing Carson's predicament, trampled the warrior with his horse. Carson stated he felt that he owed Frémont his life due to this incident. Turning south from Klamath Lake, Frémont led his expedition back down the Sacramento Valley, and slyly promoted an insurrection of American settlers, which he then took charge of once circumstances had adequately developed, known as the Bear Flag Revolt. Events escalated when a group of Mexicans murdered two American rebels. Frémont then intercepted three Mexican men on June 28, 1846, crossing the San Francisco Bay, who landed near San Quentin. Frémont ordered Carson to execute these three men in revenge for the deaths of the two Americans. Frémont's California Battalion next moved south to the provincial capital of Monterey, California, and met Commodore Robert Stockton there in mid-July of 1846. Stockton had sailed into harbor with two American warships and taken claim to Monterey for the United States. Learning that the war with Mexico was underway, Stockton made plans to capture Los Angeles and San Diego and proceed on to Mexico City. He joined forces with Frémont, and made Carson a lieutenant, thus initiating Carson's military career. Frémont's unit arrived in San Diego on one of Stockton's ships on July 29, 1846, and took over the town without resistance. Stockton, traveling on a separate warship, claimed Santa Barbara a few days later. (See Mission Santa Barbara and Presidio of Santa Barbara). Meeting up and joining forces in San Diego, they marched to Los Angeles and claimed this town without any challenge, and Stockton declared California to be United States territory on August 17, 1846. The following day, August 18, Stephen W. Kearny rode into Santa Fe, New Mexico with his Army of the West and declared the New Mexican territory conquered. Stockton and Frémont were eager to announce the conquest of California to President Polk, and wished for Carson to carry their correspondence overland to the President. Carson accepted the mission, and pledged to cross the continent within 60 days. He left Los Angeles with 15 men and 6 Delaware Native Americans on September 5. For the next six weeks, Lt. Carson guided Kearny and the 100 dragoons west along the Gila River over very rugged terrain, arriving at the Colorado River on November 25. On some parts of the trail mules died at a rate of almost 12 a day. By December 5, three months after leaving Los Angeles, Carson had brought Kearny's men to within 25 miles their destination of San Diego. A Mexican courier was captured en route to Sonora Mexico carrying letters to General Jose Castro that reported a Mexican revolt which had recaptured California from Commodore Stockton: all the costal cities now were back under Mexican control, except for San Diego, where the Mexicans had Stockton pinned down and under siege. Kearny was himself in perilous danger, as his force was reduced both in numbers and in a state of physical exhaustion: they had to come out of the Gila River trail and confront the Mexican forces, or risk perishing in the desert. While approaching San Diego, Kearny sent a rancher ahead to notify Commodore Stockton of his presence. The rancher, Edward Stokes, returned with 39 American troops and information that several hundred Mexican dragoons under Capt Andres Pico were camped at the Indian village of San Pasqual, lying on the route between him and Stockton. Kearny decided to raid Pico in order to capture fresh horses, and sent out a scouting party on the night of December 5-6. The scouting party encountered a barking dog in San Pasqual, and Captain Pico's troops were aroused from their sleep. Having been detected, Kearny decided to attack, and organized his troops to advance on San Pasqual. A complex battle evolved, where twenty-one Americans were killed and many more wounded: many from the long lances of the Mexican caballeros, who also displayed expert horsemanship. By the end of the second day, December 7, the Americans were nearly out of food and water, low on ammunition and weak from the journey along the Gila River. They faced starvation and possible annilation by the Mexican troops who vastly outnumbered them, and Kearny ordered his men to dig in on top of a small hill. Kearny then sent Carson and two other men to slip through the siege and get reinforcements. Carson, Edward Beale, and an Indian left on the night of December 8 for San Diego which was 25 miles away. Because their canteens made too much noise, they were left along the path. Because their boots also made too much noise, Carson and Beale removed these and tucked them under their belts. These they lost, and Carson and Beale traveled the distance to San Diego barefoot through desert, rock, and cactus. Following the recapture of Los Angeles in 1847, Frémont was appointed Governor of California by Commodore Stockton. Frémont sent Carson to carry messages back to Washington City. He stopped in St. Louis and met with Senator Thomas Benton, who was a prominent supporter of the settling the West and a proponent of Manifest Destiny, and had been prominent in getting Frémont's expedition reports published by Congress. Once in Washington, Carson delivered his messages to Secretary of State James Buchanan, as well as had meetings with Secretary of War William Marcy and President James Polk. Carson's public image as an action hero had been sealed by the Frémont expedition reports of 1845. In 1849, the first of many Carson action novels appeared. 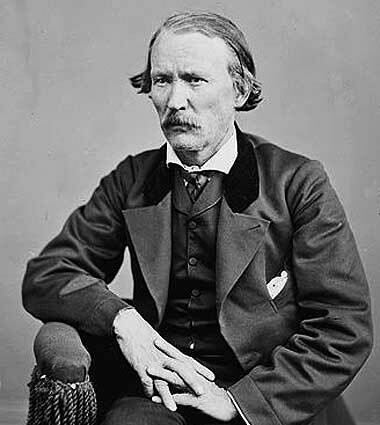 The first, written by Charles Averill, bore the name Kit Carson: The Prince of the Gold Hunters. This type of western pulp fiction was known as "blood and thunders". In Averill's novel, Carson finds a kidnapped girl, and saves her, vowing to her distraught parents in Boston that he would scour the American West until she was found. This book was among the possessions found by Carson and Major William Grier when they recovered the body of Mrs Ann White in November, 1849. Mrs. White and her daughter had been taken captive by Jicarilla Apaches several weeks earlier. She had been traveling with her husband James White, a trader, to Santa Fe, when a group of Indians approached them as they camped along the Santa Fe trail. Mr. White tried to disperse the Indians with his rifle, but they attacked, killing everyone except Mrs White, her daughter, and a servant. Carson and Grier tracked the Indians for twelve days to their camp on the Canadian River. Carson wanted an immediate attack, while Grier wanted to parlay with the Jicarillas. The conflict in views caused delay and allowed the Indians to disperse from camp and escape. In the process, Mrs. White appears to have attempted to flee, and was killed by an arrow through the heart. The episode of the White massacre haunted Carson's memory for many years. He once stated "I have often thought that as Mrs White read the book, she prayed for my appearance, knowing that I lived nearby". His fear was that the book had given her a false hope. He wrote later "I have much regretted the failure to save the life of so esteemed a lady", and he was troubled by the implications and false image that developed around his celebrity status. Overall command of Union forces in the Department of New Mexico fell to Colonel Edward R. S. Canby of the Regular Army's 19th Infantry, headquartered at Ft. Marcy in Santa Fe. Carson, with the rank of Colonel of Volunteers, commanded the third of five columns in Canby's force. Carson's command was divided into two battalions each made up of four companies of the First New Mexico Volunteers, in all some 500 men. Advancing up the Rio Grande, Sibley's command clashed with Canby's Union force at Valverde on February 21, 1862. The day-long Battle of Valverde ended when the Confederates captured a Union battery of six guns and forced the rest of Canby's troops back across the river with losses of 68 killed and 160 wounded. Colonel Carson's column spent the morning on the west side of the river out of the action, but at 1 p.m., Canby ordered them to cross, and Carson's battalions fought until ordered to retreat. Carson lost one man killed and one wounded. Colonel Canby had little or no confidence in the hastily recruited, untrained New Mexico volunteers, "who would not obey orders or obeyed them too late to be of any service." In his battle report, however, he did commend Carson, among other volunteer officers, for his "zeal and energy". After the battle at Valverde, Colonel Canby and most of the regular troops were ordered to the eastern front, but Carson and his New Mexico Volunteers were fully occupied by "Indian troubles". Contact between the Navajo and the U.S. Army was prompted by a Navajo raid on Socorro, New Mexico near the end of September, 1846. General Kearny, passing nearby on his way to California after his recent conquest of Santa Fe, learned of the raid and sent a note to Col. William Doniphan, his second in command in Santa Fe. He asked Doniphan to send a regiment of soldiers into Navajo country and secure a peace treaty with them. Despite the treaty, raiding continued in New Mexico by the Navajo, as well as the Jicarilla Apache, Mescalero Apache, Ute, Comanche, and Kiowa. On August 16, 1849 the U.S. Army began an expedition into the heart of Navajo country on an organized reconnaissance for the purpose of impressing the Navajo with the might of the U.S. military, and to map the terrain for further operations and to plan forts. The expedition was led by Col. John Washington, the military governor of New Mexico at the time. The expedition included nearly a thousand infantry (U.S. and New Mexican volunteers), hundreds of horses and mules, a supply train, 55 Pueblo Indian scouts, and four artillery guns. In this setting, Washington was still able to communicate to the Navajo that in spite of the hostile situation, they and the whites could "still be friends if the Navajo came with their chiefs the next day and signed a treaty". This is in fact, exactly what the Navajo did. The next day Chief Narbona came once again to "talk peace", along with several other headmen. An accord was reached on nearly every matter. When a New Mexican thought he saw his stolen horse and the Navajo protested its return, a scuffle broke out. (The Navajo position was that the horse had passed through several owners by this time, and now rightfully belonged to its Navajo owner). Col. Washington sided with the New Mexican. Since the Navajo owner now fled the scene, Washington told the New Mexican to go pick out any Navajo horse he wanted. The rest of the Navajo present figured out what has happening, and turned and fled. At this, Col. Washington ordered his soldiers to fire. Seven Navajo were killed in the volleys; the rest ran and could not be caught. One of the dying was Chief Narbona, who was scalped by a New Mexican souvenir hunter. This massacre prompted the warlike Navajo leaders such as Manuelito to gain influence over those who were advocates of peace. Raiding by Amerindians had been rather constant up through 1862, and New Mexicans were becoming more outspoken in their demand that something be done. Col. Canby devised a plan for the removal of the Navajo to a distant reservation and sent his plans to his superiors in Washington D.C. But that year, Canby was promoted to general and recalled back east for other duties. His replacement as commander of the Federal District of New Mexico was Brigadier General James H. Carleton. Carleton believed that the Navajo conflict was the reason for New Mexico's "depressing backwardness". He naturally turned to Kit Carson to help him fulfill his plans of upgrading New Mexico, and his own career: Carson was nationally known and had been employed by a chain of preceding military commanders in their careers. Furthermore, Carleton believed there was gold in the Navajo's country, and felt they should be driven out in order to allow the development of this possibility. The immediate prelude to Carleton's Navajo campaign was to force the Mescalero Apache to Bosque Redondo. Carleton ordered Carson to kill all the men of that tribe, and say that he (Carson) had been sent to "punish them for their treachery and crimes". Under Carleton's direction, Carson instituted a scorched earth policy, burning Navajo fields and homes, and confiscating or killing their livestock. He was aided by other Indian tribes with long-standing enmity toward the Navajos, chiefly the Utes. Carson was pleased with the work the Utes did for him, but they went home early in the campaign when told they could not confiscate Navajo booty. There were no pitched battles and only a few skirmishes in the Navajo campaign. Carson rounded up and took prisoner every Navajo he could find. In January 1864, Carson sent a company into Canyon de Chelly to attack the last Navajo stronghold under the leadership of Manuelito. The Navajo were forced to surrender because of the destruction of their livestock and food supplies. In the spring of 1864, 8,000 Navajo men, women and children were forced to march or ride in wagons 300 miles (480 km) to Fort Sumner, New Mexico. Navajos call this "The Long Walk". Many died along the way or during the next four years of imprisonment. In 1868, after signing a treaty with the U.S. government, remaining Navajos were allowed to return to a reduced area of their homeland, where the Navajo Reservation exists today. Thousands of other Navajo who had been living in the wilderness returned to the Navajo homeland centered around Canyon de Chelly. Carson died at age 59 from an aneurysm in the surgeon's quarters in Fort Lyon, Colorado, located east of Las Animas. He is buried in Taos, New Mexico, alongside his wife, Josefa ("Josephine"), who died a month earlier of complications following child birth. His headstone inscription reads: "Kit Carson / Died May 23 1868 / Aged 59 Years." Many of the early images and recollections of Carson by his peers and early writers portray him in a positive light. Albert Richardson, who knew him personally in the 1850s, wrote that Kit Carson was "a gentleman by instinct, upright, pure, and simple-hearted, beloved alike by Indians, Mexicans, and Americans" (Richardson, p. 261). Oscar Lipps also presented a positive image of Carson: "The name of Kit Carson is to this day held in reverence by all the old members of the Navajo tribe. They say he knew how to be just and considerate as well as how to fight the Indians" (Lipps, p. 59). On January 19, 2006, Marley Shebala, senior news reporter and photographer for Navajo Times, quoted the Fort Defiance Chapter of the Navajo Nation as saying, "Carson ordered his soldiers to shoot any Navajo, including women and children, on sight." This view of Carson's actions may be from General James Carleton’s orders to Carson on October 12, 1862, concerning the Mescalero Apaches: "All Indian men of that tribe are to be killed whenever and wherever you can find them: the women and children will not be harmed, but you will take them prisoners and feed them at Ft. Stanton until you receive other instructions" (Kelly, p. 11). Notes on Mohave Indians, San Gabriel Mission & possibly the Chemehuevi Indians.